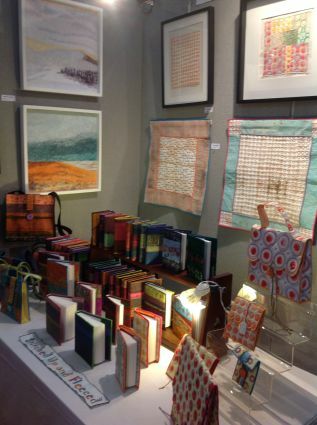 Here is a view of my stand at this year's Contemporary Textile Fair at the Landmark Arts Centre in Teddington, London. I drove down here from Sheffield yesterday with Jude Shore with my car full to the ceiling with our work, display stands, equipment and of course our clothes for the 3 day event, covering every eventuality of indoor heating and outdoor weather! We decided that being spatially aware is essential for efficient packing and only my stool had to be left behind. Now that the stand is up and the event is open I have been taking photographs of the display I have created. I have found, over the years, that grouping items by colour helps create a unifying atmosphere, particularly when there are many different items to put together. Of course my colour schemes aren't random and are part of what I use when I develop my designs from an observed scene. 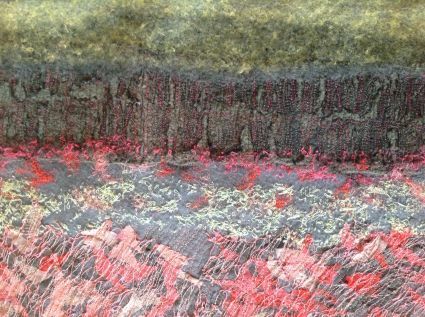 This is a framed textile panel worked in response to photographs taken on the Longshaw estate in Derbyshire. It is a stylised design reminiscent of trees and rough pasture incorporating the colours of the rhododendrons. 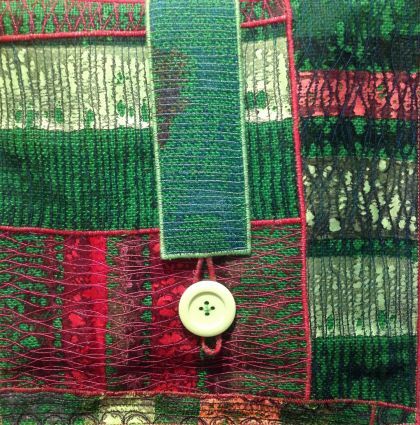 This is the front of a bag from my latest collection. You might be able to see the colour references to the landscape above, the trees and the rhododendrons. I find that developing a collection of work from one source means that when I display the work everything looks good together. I have had many compliments today about the colour and it seems to have been particularly welcomed by the visitors who are coming in from the cold, grey and snowy day outside. One customer commented that the colours them selves made her feel warm and 'summery'. I hope she also enjoys drawing in her book.